It’s been a little more than a week since my ankle surgery. Before I went under the knife last Tuesday, I finished three beautiful peach small garden bouquets. I am normally approached to make large bridal bouquets, like this and this. If I make small bouquets, it’s usually for the maid of honour and/or bridesmaids, and always as part of a set of bridal bouquets. My brides, while they’re quite happy to pay a bit more for their bouquet, understandably tend to be on a budget when it comes to their fairly large bridal party, so I’m often restricted by how intricate I can make the smaller bouquets. This time, my bride, Jessica, approached me to make small bouquets to gift to her mother and her fiance’s mother on their wedding day. She had a reasonable budget which wasn’t nearly as tight as some of my other brides. I was quite satisfied that with her budget, I would be able to deliver her something that was more intricate than some of my past bridesmaid bouquets. Jessica was super easy to work with. She made her own felt flower bouquet in her wedding colours of light peach, light pink, and cream. The mother’s bouquets wouldn’t go down the aisle, so they didn’t have to coordinate with her bouquet. So we spoke about taking colours from her bouquet as a jumping point. She especially loved my Orange and Pink bouquet that was featured on 100 Layer Cake with the bright/ bold colours. We decided that we would incorporate some bright/bold peaches and/or pinks and work with lighter versions of those colours as well. A few weeks after she approached me for the order, her fiance contacted me to ask me to make a 3rd bouquet for Jessica. He wanted it to be a surprise, so that arrangement was made between us. I thought it was so sweet for him to think of that! Since I already spoke to Jessica about her ideal bouquets for the mothers, I knew what her preferences were. My small, but intricate bouquets, have about a 10″-12″ diameter. When I was envisioning these bouquets, I knew I would not be able to use large peonies or large dahlias or any large flower really. If I used only one, it would throw off the scale of the bouquet and look unbalanced. If I used only large flowers, it would make the bouquet look very sparse and emphasize how small the bouquets were. So I knew that I had to keep the flowers small in order to make the bouquets look fuller which meant I had to work with “accent” flowers, or flowers that are usually added to create accents and interest, versus traditional focal flowers that are larger and say “look at me!”. Perfect. I love accent flowers. I’m often drawn more to accent flowers than focal flowers. And the ranunculus is my favourite accent flower. Ranunculuses come in various colours and shapes, so it’s really a perfect flower to use in practically every arrangement. They have thick stems and their stems can point straight up or bend and droop. Here, I’ve used them as the focal/main flowers. I’ve made a variety of ranunculuses in different sizes, colours, and with different petal placements. I’ve placed them in the bouquet on different levels, some deeper into the bouquet, and some higher up. Most are turned away from directly facing out; they’re faces look down or up or sideways. I made ranunculus buds to create further variation in sizes and to also throw in slightly different colours in smaller doses. I love that I can use the buds to create dimension by merely placing them so they extend above the the bloomed ranunculuses. They emphasize the different planes or layers. I really had a fun time making them. Their construction is completely different from the full blooms, and in fact, forced me to use new techniques to achieve that flat round shape that the buds are known for. My favourite and the most challenging part of the process was manipulating the colours of each bloom so they look cohesive when together with the other flowers.That way, I don’t need to determine which flower would go in which bouquet ahead of time; I knew that as long as all of the flowers and foliage I made looked good together, it didn’t matter too much which ones went together. As you know, I’m really particular about colour and I never use the crepe colours right “out from the tube” so to speak. For these bouquets, I used a variety of Pan Pastels, especially the Pan Pastel in Orange, Winsor & Newton Inks in Deep Red, and Ranger Alcohol Inks in Coral, applied to a variety of peach, orange, and red crepe papers in different weights. 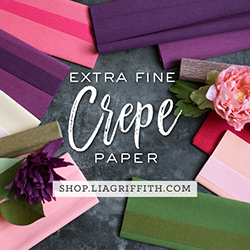 In my experience, I’ve found that if I use one crepe paper colour and apply a colour variation to it, I can get 2 flowers with 2 different colourings that would sit adjacent to each other on the colour wheel. Similarly, if I apply another colour variation to that crepe paper colour, I’ll get a 3rd variation that will always look when placed beside the other two. However, it’s easier said then done. Some of you have asked me how I made the stems of the ranunculuses so thick; like many paper florists, I used a clear vinyl tubing. You can buy the tubing from the plumbing section of the hardware store (I bought mine at Rona), or cheaper online. You want to get the tubing with smallest outer diameter as possible like this one with a 1/4″ outer diameter. What I do is I cut the correct length and slip it over the stem wire, glue it onto the bottom of the flower with hot glue, and cover it with green floral tape or crepe paper. It allows me to increase the size of the flower stem without losing the ability to bend the stem in any direction or angle. I use this technique for my poppies as well. For the ranucs, I added an additional step though; after cutting the correct length, I cut the tube lengthwise and cut off a sliver about 1/2 cm to further reduce the diameter of the tubing. I then taped it back together before slipping it over the stem wire. I made sweet peas to add a little bit of textural interest and ruffles. They’re made with doublette crepe in white/peach and some which had been dip dyed. I used white/peach that had been wet with water to let the inks run and blend together. I finished the sweet peas by spraying them gently with a Design Master TintIt spray in Sepia (I got mine at Michaels). The sepia makes them look less “sweet”, and their addition to the arrangement “grounds” it. I usually make my foliage last because I find that they need to compliment the flowers, so I design them only after I have a clear idea of what type of movement would look good with the flowers I’ve made. To find inspiration, I foraged through my brother’s backyard and cut different types of greens that I thought had interesting shapes or colour. There was one shrub that grew low and had variegated leaves. I liked how the leaves were fairly small, and one branch held several smaller stems. So I recreated it in paper. I love how it looks in the bouquet. I’m able to move one branch in one direction and another in a different direction if I want. I place it in the my arrangement and let it’s placement tell me where to put the next flower. I strive to make foliage that bounce when you walk with it so I use very thin gauge stem wire to emulate the strong but flexible stems of the real plant. The other foliages are coral bells (inspired by the ones I am growing in my garden), ferns, a vine, a branch, and a garlic mustard plant. I made these ferns last year when I was making Marilyn’s bouquet. I remember I made them while I was at the cottage, and didn’t even end up using them for her bouquet. Their limey sourness were perfect for this bouquet. The branch and vine are my staple and my signature; I would add them to everyone of my bouquets if I could! They’re delicate and whimsical. I can’t even describe how I make them; I just do. After I make them, I bend them in random directions until I like how they look. Then I use them in the bouquet and let them tell me where to put them. I knew I needed flowers that would peek up and between the flowers. The garlic mustard plant provided the perfect little white flowers that float about and between the ranunculuses. I also recreated these from real ones found in my brother’s backyard, however, added a variegated edge because I wanted it to create more visual interest. Too bad the real thing is a very invasive specie and most people would rather rid of them than see them recreated. I also added green fritilleria to Jessica’s bouquet. I really love how they add another touch of the garden to her bouquet. They’re really time consuming to make and I’m not completely happy with them, although I really like the colouring I achieved with the alcohol ink on doublette. I’m going to try to make them again and see if I can make them look even more delicate. The Mother’s bouquets are slightly more simple, without the fritilleria and the orange ranunculus. I wish you guys could see how the foliage and the buds bounce and move when I walked with it. I took a few videos of them, but I really should have taken videos of them in my hands – DUH!. I also took the videos on portrait view, which is a newbie no-no. Ah we live and learn. I really loved making these bouquets, especially when I began putting them together. They were a challenge to make because they’re small, so they have less real estate in which to make it look cohesive and full. I’ve seen too many (and made too many) small bouquets that look too sparse, too round, and where you can literally count how many flowers on in the bouquet. I don’t want you to be able to count; I want you to see the entire bouquet as one construct, and to wonder, how did she do that?